Guest post from Shelly of Frugal Family Home. Winter is in full swing at my house and with winter comes cold wind. Even when I cover my skin the cold wind can be really drying. The drier the air the drier my skin becomes. That’s why I love sugar scrubs. They are great for smoothing out my dry winter skin. I use extract for the scent in this recipe, but if you have a favorite essential oil you like that would work great too. You can also include in this recipe chopped fresh mint, but because fresh mint doesn’t last very long I would only make a batch big enough to last a week. Dried mint should work well in the recipe too. If you need to make more than one batch for gifts, I would mix them up separately. Getting the sugar and the oil to combine well might be hard if you double or triple the recipe. I’ve also made some cute printable labels to use with the jelly jars. I like to print the labels onto cardstock paper and place the cutout labels between the lid and the ring of the jelly jars. Measure out the sugar into a medium to large bowl. You want enough room to be able to really stir the oil in. 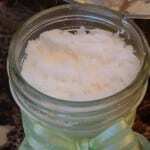 Melt the coconut oil in the microwave in a microwave safe bowl. I usually use my glass measuring cup to do this step. The pouring spout helps to make it easy to pour the warm coconut oil into the sugar bowl without spilling. 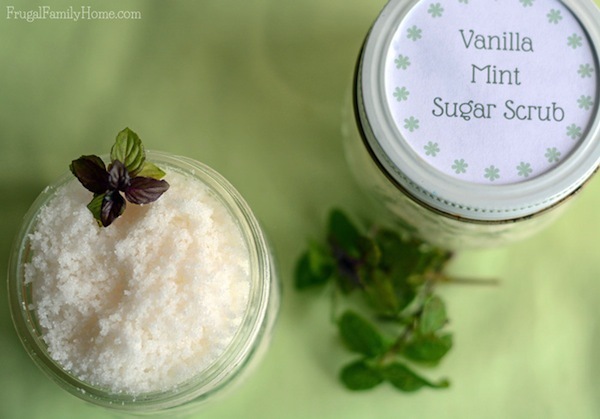 Once the oil is added to the sugar, also add the peppermint and vanilla extracts. If you want more scent you can to add a few more drops. This is also the time to add green food coloring if desired. I skipped it in my batch. Then stir to combine. When it’s mixed adequately it will be slightly clumpy without any loose sugar. The main thing to look for is that all of the sugar is coated with the coconut oil. Add the sugar scrub to a clean jar. I used small jelly jars with the two-piece lids for the top. This recipe will fill two to three jars. Once the jars are empty they can be washed and refilled with a new batch of sugar scrub. If you are making these for a gift, you can dress the jelly jars up with these free printable labels or ribbon. Or even place a square of fabric between the two pieces of the lid as you close it up. Here’s the recipe so you can make a batch for yourself or to give as a gift. In a medium to large bowl add the sugar. 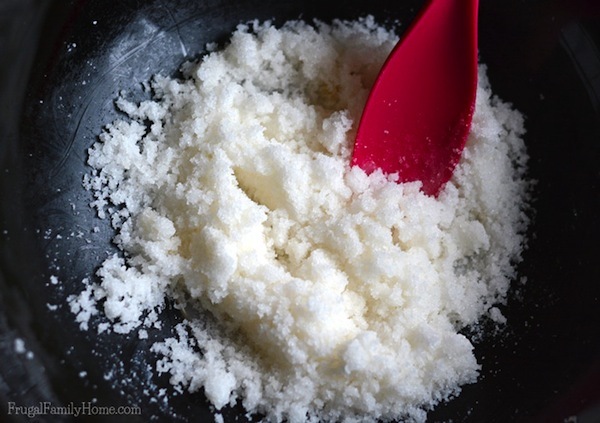 In a microwave safe bowl, add the coconut oil and microwave at 30-second intervals until it is melted. This can also be done in a pan on the stovetop over medium heat. Once the coconut oil is melted add it to the sugar along with the peppermint and vanilla extract. As well as the green food coloring if desired. Stir well to combine. Making sure all of the sugar is coated with oil. The mixture will be lumpy, but the sugar shouldn’t be dry. Add to a clean glass jar with a lid to store. 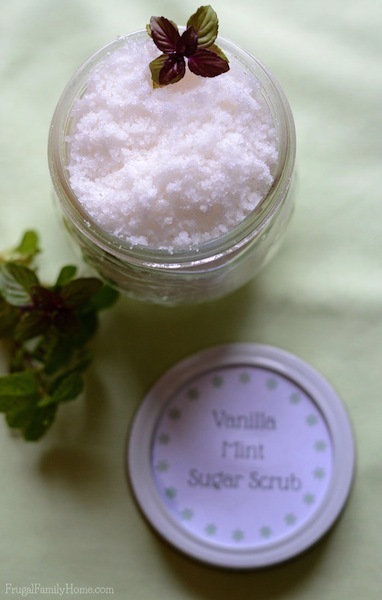 To use, while in the shower, scoop some of the sugar scrub into your hand and rub on the skin. Rinse off with water. 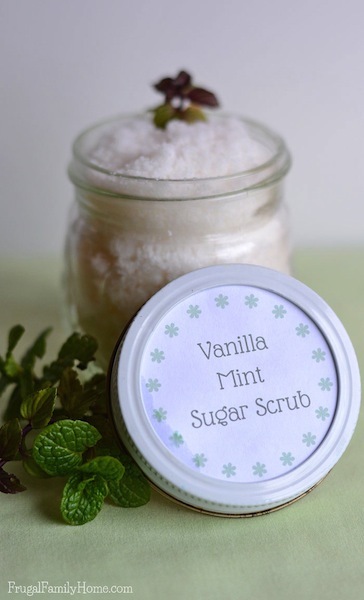 Use caution when using the sugar scrub in the shower as it can make the tub or shower floor slippery. Making it easier to fall in the shower or tub. I’ve found sugar scrubs to be great at making my winter skin feel so much better. 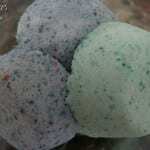 The sugar gently exfoliates the skin and the coconut oil adds a nice softness to it. 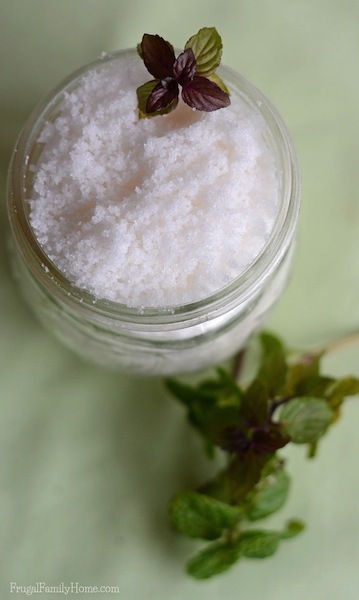 This sugar scrub should last at room temperature about three months. I use mine about 3-4 times a week and it never lasts that long. If you’re not ready to make this recipe now, be sure to pin this recipe to one of your Pinterest boards so you can find it when you need it. Have you used sugar scrubs before? Shelly is a wife to her hubby of 25 years, she had two kids 10 years apart and loves to share her homemaking tips, frugal living ideas, recipes, and DIY projects on her blog, FrugalFamilyHome.com. Red Velvet Lava Cake	Why Should I Start A Budget? I do too! Isn’t it fabulous, Sandra!